"Kind of Cl'Ude ~ but it UJorks~ boy~ it UJOrksl" Alan Ner. ueH to Herb Simon~ C1rl'istmas 1955 In 1954 a computer program produced what appears to be the first computer generated mathematical proof: Written by M. Davis at the Institute of Advanced Studies, USA, it proved a number theoretic theorem in Presburger Arithmetic. Christmas 1955 heralded a computer program which generated the first proofs of some propositions of Principia Mathematica, developed by A. Newell, J. Shaw, and H. Simon at RAND Corporation, USA. In Sweden, H. Prawitz, D. Prawitz, and N. Voghera produced the first general program for the full first order predicate calculus to prove mathematical theorems; their computer proofs were obtained around 1957 and 1958, about the same time that H. Gelernter finished a computer program to prove simple high school geometry theorems. 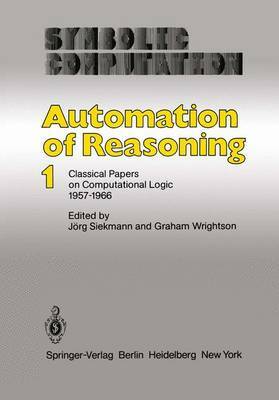 Since the field of computational logic (or automated theorem proving) is emerging from the ivory tower of academic research into real world applications, asserting also a definite place in many university curricula, we feel the time has come to examine and evaluate its history. The article by Martin Davis in the first of this series of volumes traces the most influential ideas back to the 'prehistory' of early logical thought showing how these ideas influenced the underlying concepts of most early automatic theorem proving programs.